A WEEK after retiring from politics and 40 years after first wandering into a Tasmanian forest, Bob Brown yesterday gazed up at old-growth trees in Victoria's central highlands for the first time and gave a commitment to campaign to save the endangered Leadbeater's possum. The former Greens leader was the first senior politician to accept an open invitation from scientists to visit the forests around Healesville and Marysville to see the impact of logging and bushfire, which they say has reduced the tiny possum's population to less than 1000. Today he plans to join protesters at a camp blockading logging at Mt St Leonard, near Toolangi. When he first visited the island state in 1972, in part in an ambitious search for the Tasmanian tiger, Dr Brown was stunned to learn its extinction was linked to the Tasmanian Parliament placing a £1 bounty on its head. He said the situation facing Leadbeater's possum was similar, citing scientific advice that it could face extinction within 20 years. ''The bounty is on the trees the possum lives in here, by deliberate government fiat. It is listed as imperilled by the federal legislation, which says therefore you must have a meaningful plan to bring it up. None of that is in place,'' he said. The plight of Leadbeater's possum, Victoria's faunal emblem, has been at the centre of a campaign by conservationists and scientists to end clearfell logging. An ecology team headed by Australian National University professor David Lindenmayer estimates its numbers were cut in half by the Black Saturday bushfires, and say its remaining population is under pressure from forestry. The forestry industry says it is acting within the law, which requires it to leave pre-1900 trees and prime possum habitat. In March, Healesville group MyEnvironment lost a Supreme Court bid to stop logging in parts of the central highlands, though Justice Robert Osborn said there was a strong case for a review of protection of the possum's habitat in the wake of Black Saturday. 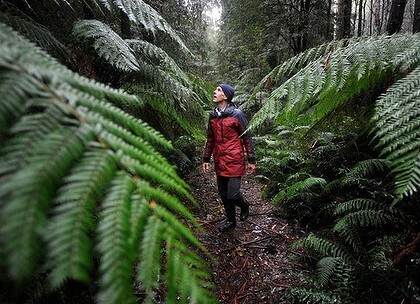 Walking beneath old-growth forest at Camberville, east of Marysville, Dr Brown said it felt like visiting Tasmania's Styx Valley, though at higher altitude. Professor Lindenmayer said he had extended the same invitation to tour the forests to Prime Minister Julia Gillard and Opposition Leader Tony Abbott. HUNDREDS of tonnes of native forest logs harvested for timber have instead been "torched''. They have been torched by a government agency, eyewitnesses say. And the locals question the viability of the Victorian Government logging agency. VicForests harvested coupes near Genoa last year. Locals say logs good enough for timber products – known as sawlogs – were not removed from the site, instead being pushed into piles and burned. And a local firewood business is fuming - it says between 400 and 600 tonnes of logs it was negotiating to buy have been reduced to ash. But VicForests says it used the wood available within the coupe. Genoa firewood business owner Fred Becker, who along with his brother had run a sawmill in the area for decades, said he'd monitored local VicForests' coupes near his business for months. "We offered to buy and process the logs onsite,'' Mr Becker said. "We had meetings with them. It had been logged about nine months, the logs were just sitting there. There was between 400 and 600 tonnes. It could have sustained us for two or three years. "We checked it out (again) after they torched it. I feel sick in the guts." Rather than allow his business to use the logs, the government had instead assigned his business a new "green" coupe to log, he said. This meant a new coupe would be logged unnecessarily and the wood he'd get from the new coupe would have to be dried over summer before it was ready to sell, Mr Becker said. A VicForests spokesman said all timber "which could be supplied to customers was recovered'', "with firewood delivered to a customer holding an existing firewood contract with VicForests''. A regeneration burn was completed to re-establish forest on the site, he said. A local who would not be named said log trucks had to be dragged out of the coupes by bulldozers because conditions during harvest were so wet. Wallagaraugh landowner Tony Brindley said VicForests shouldn't "go to all that trouble and then burn it". "They were C grade (saw) logs, I know for a fact," Mr Brindley said. "There were hundreds, not half a dozen. "It's been done disgracefully. (Silt) is washing into the gullies and the Wallegrah River. Environmentally, it's a frigging disaster," Mr Brindley said. "There's no money in it for anyone, but . . . they run a weird dole system where they employ people just to keep the thing ticking over," Mr Brindley said. VicForests logs about $130 million worth of native forest a year. It reported a profit of $2.3 million in the financial year ending 2011, a profit of $3.6 million in 2010, a loss of $5 million in 2009, a profit of $538,000 in 2008 and a loss of $17,000 in 2007. It has not paid any dividend to government in the past four years. Its 2011 annual report stated "net cash flow from operating activities remained negative as a major sawlog customer delayed payments" – and "total liabilities increased from $36.8 million in 2010 to $42.5 million". The Auditor General has never completed a report on VicForests. But the VicForests spokesman said the government body was "part of a broader timber industry which contributes more than $1 billion to Victoria's economy each year". "In addition to posting a profit of $2.3 million last year, VicForests allocated contracts worth more than $100 million to small and medium sized businesses across regional Victoria," the spokesman said. "Another $7 million was spent maintaining and upgrading the road network in Victoria's State forests. All harvesting operations comply with the Code of Forest Practice." Peatland recently cleared by burning near the village of Kayee Lon in Aceh. IN 2007, young Australian entrepreneur Dorjee Sun began a mission to save the world. He criss-crossed the globe with a documentary crew, inserting himself into climate change negotiations in a way that eventually made him one of Time magazine's ''Heroes of the Environment''. At the same time, climate change was killing then prime minister John Howard. An Inconvenient Truth was playing on Australian screens, the Stern report shocked the world and opposition leader Kevin Rudd was capturing the popular mood that something - anything - must be done. It was, in retrospect, the high-water mark for belief in action on climate change and low tide for the sceptics. It was in this atmosphere that Howard and Sun both found climate salvation in the same place - the tropical peat forests of Indonesia. Howard's answer to the same question was a massive cash injection. It was Howard's silver bullet, his version of a ''direct action'' pledge that cleverly skirted his refusal to sign Kyoto. In December, the United Nations caught up, agreeing in Bali, amid backslapping and cheers, to accept Reducing Emissions from Deforestation and Forest Degradation, or REDD, as a valid way of tackling greenhouse gas emissions. Five years on, the silver bullet has misfired. The REDD schemes in Indonesia funded with Australian government money have come under serious criticism for overstating their aims and under-delivering on results. Greens leader Christine Milne recently labelled the largest of them a ''total failure''. The private sector has fared even worse. Most of the for-profit schemes in Indonesia have faltered or fallen spectacularly, recriminations flying. Dorjee Sun's landmark project is one of them. A deal he set up with the government of Aceh, Indonesia's westernmost province, to develop a carbon credit scheme has stalled, perhaps fatally, and 770,000 hectares of forest is in limbo. Sun himself, in the eyes of the environmental lobby, has sold out. For cash and shares worth millions he sold half of his business to a Canadian gold mining company whose aim is to turn a forest-clad mountaintop into an open-cut mine using cyanide leaching to extract the riches. His partner in the effort, former Aceh governor Irwandi Yusuf, was so disillusioned with REDD he accused the global community of using his region as a ''carbon toilet''. Five years after high tide, Indonesia remains one of the biggest deforesters on the planet. Once Australia's best hope for REDD, it is yet to generate a single carbon credit or earn one dollar for preserving its forests. Credible observers wonder if it ever will. For the Gillard government, this is more than just a historical problem. Labor's carbon trading scheme, which begins its fixed-price period on July 1, needs a big supply of carbon credits sourced from other countries. Without 434 million tonnes of offsets bought offshore per year by 2050, Treasury believes Australia cannot meet even its modest greenhouse reduction targets. Until now, it has been believed saving Indonesian forests could supply many of these offshore credits quickly and cheaply. ''A post 2012 outcome that puts us on a path to 450 [parts per million of carbon dioxide in the atmosphere] is only achievable with comprehensive coverage of REDD,'' said then climate change minister Penny Wong in 2009, adding that it would reduce the cost of global emission reduction ''by around 20 to 25 per cent''. The government's National Carbon Offset Standard announced in March makes it possible for businesses to buy forestry credits, with suitable safeguards. But as things stand now, even if a global carbon trade materialises, many wonder if Indonesian forests can ever play a part. In concept, REDD is simple. Every tonne of carbon locked up in peatlands or inhaled by trees, and saved from logging or palm oil plantations, creates carbon credits. These can be sold to big companies that cannot reduce their own emissions for a lower price and the profits go to the forest communities, local governments and project proponents. In theory it's a win-win-win: emitting companies gain access to cheap credits; the forests and their orang-utan, tiger and elephant populations are preserved; and the income stream replaces the money on offer from the loggers, miners or palm oil plantations. But these benefits have been excruciatingly slow to emerge. As a mukim, Ibrahim has attended multiple meetings - he counts 31 since 2007 - on REDD. At a recent meeting they were warned solemnly about potential corruption in a program that does not even exist. Ibrahim is careful to make clear he wouldn't mind being paid cash to save the forests. He turns to me, grinning broadly, and says: ''Australia! Send us your money!'' He insists, however, there is no need for it because the local people have learnt to look after the forest anyway. But about 20 kilometres down the road, the smell of recent burning belies his faith. Here, near the village of Kayee Lon, the ground is black, the forest devastated. This fire is fresh, was deliberately lit and was designed to clear the forest for palm oil. An 11-man crew is clearing the burnt trees then cutting down more for firewood. Their leader, Safari, says they have been working for local land-owners since 2007, busily clearing forests at the rate of about 15 trees per day. The ground underfoot is soft. Step too heavily and your foot sinks deep. This is peat and it contains millions of tonnes of carbon dioxide. As long as the water-soaked forest is intact, the carbon remains locked in place. But as soon as it is cut and burnt, then drained via canals for agriculture, the woody mass - which can be metres thick - decomposes, releasing its stores of carbon dioxide into the atmosphere. Sumatra, Borneo and West Papua have among the richest peat forests in the world. Those in Borneo alone hold up to 70 times the carbon emitted annually by the combustion of fossil fuels worldwide. The forest in this beautiful, mountainous province remains relatively intact because for decades the fierce combatants in the Free Aceh Movement's separatist battle against Indonesia used it for refuge. But that is beginning to change as people seek out economic opportunities. The burning in Kayee Lon is probably illegal. Under national laws, clearing deep peat is prohibited. But good luck getting these laws enforced. On one fire-scarred plot, marked and unmarked police cars unload oil palm seedlings. Workers tell us ''high-ranking officials'' from the Aceh police force actually own the land. ''Everyone has a permit,'' insists a worker, Syukul, on a neighbouring piece of land. This may well be true. In rural Indonesia, land title is rarely clear. And it's not just the forest that's tangled and impenetrable. When democracy came to Indonesia after 1998, the government in Jakarta radically de-centralised, conferring significant power on local authorities and regional (the equivalent to Australian state) governments. These local governments issue permits over land with very little scrutiny. Corruption is rife, and the judges are as bad as the bureaucrats - in Aceh, 20 million rupiah ($A2200) is enough to get criminal charges dismissed. But when Dorjee Sun first came to Aceh in 2007 and sold the miracle of REDD to his new friend, Governor Irwandi, none of this seemed like an obstacle, and it is not suggested that either have acted dishonestly. Sun and Irwandi's plan was to save 770,000 hectares of this forest, home to 982,000 people as well as orang-utans, elephants and Sumatran tigers. Every year for the next 30 years, 3.4 million tonnes of carbon dioxide emissions would be avoided and the credits sold on the global carbon market. They even convinced American banking giant Merrill Lynch to trade the carbon credits for them in an options deal worth up to $10 million. The deal made modest celebrities of Sun and Irwandi, who were portrayed as practical environmentalists using the profit motive to save the planet. Sun became a 2009 Time magazine Environmental Hero; Merrill Lynch won the 2008 Carbon Finance Transaction of the Year. Sun is not so naive any more. The contractual negotiations were gruelling and the local politics complex. Even an accurate map of the area proved elusive. Then last year his sponsor, Irwandi, became involved in a fight for his political life which, two months ago, he lost. A spokesman for Irwandi's replacement as Aceh governor, Zaini Abdullah, would say only that everything to do with Ulu Masen was now under review. Dr Jeff Carmichael, a businessman and foundation chairman of the Australian Prudential Regulation Authority, has a ''seven-figure sum'' invested in Sun's project. He remains fully supportive of Ulu Masen, but says the biggest risk has always been Aceh's politics. If the new governor goes cold, the project ''probably comes to a stop; there's no point putting more money into it''. In Sun's view, the biggest problem was the failure of the global community to come up with a large-scale carbon market for REDD credits. Carbon credits are now bought and sold on what is called the ''voluntary market''. Airline companies use this to offset the emissions from their flights, as do some manufacturing companies to paint themselves green. If a global trading market ever evolves under the United Nation's painfully drawn-out processes, it would be a ''compliance market'' vaster, deeper and more able to provide financial incentives to develop REDD schemes. But the only existing market, run by the European Union, does not accept forest credits. The Rio+20 summit this month marks 20 years since the first Earth Summit, but a global trading system still seems a long way off. Without this, what Sun calls ''the cavalry of carbon'', any large-scale REDD scheme is going to have trouble competing against the other possible land uses in Indonesia. So, as illegal burning and mining continues, Sun's project is becalmed. Some of the forest rangers who are employed to protect the trees ''still cut the trees themselves'', says Firman Hidayat, who once helped train people here in REDD. Sun says he has not given up, but he has changed his idea of what's possible. He is now focused on ''REDD 2.0'' - doing direct deals with big companies to protect the remnant forests within their concessions. In Ulu Masen, REDD 2.0 meant ceding a forest-clad mountaintop, Miwah, a half-day trek from the nearest road, to a company that wants to make it into a 6000-hectare, open-cut gold pit. In May last year, Sun sold half the shares in Carbon Conservation to Vancouver-listed miner East Asia Minerals for $US700,000 plus 2,584,210 shares - then worth $3 million - in the mining company. The gold under Miwah is worth $5 billion. East Asia Minerals does not yet have a permit to mine it because it lies underneath protected ''primary forest''. But environmentalists have accused Sun of allowing the company to improve its chances of gaining government approval by ''greenwashing'' the venture. Elfian Effendi of respected Indonesian organisation Greenomics, argued that Sun used the carbon project as collateral to make money. And Frank Momberg, the chief of Flora and Fauna International - Sun's former environmental and community partner in Ulu Masen - says he no longer has a relationship with Carbon Conservation. According to Sun, the deal was a genuine attempt to sacrifice a small part of Ulu Masen to protect the rest. The miner would pay ''substantial'' royalties to save the forests outside the actual mining zone. Sun says the gold company's former CEO Mike Hawkins, was sincere in his desire to develop ''green gold'' - an environmentally friendly product that could be compared to ''blood-free diamonds'', using new, green mining techniques. But East Asia Minerals has changed chief executive twice since then. Late last year it installed Ed Rochette, a renowned mining Mr Fix-it who told a recent conference in Bali Indonesia was, ''without a doubt, one of the top-three places [in the world] for current investment in mineral projects''. Sun concedes Rochette regards the ''green gold'' deal as a legacy issue and ''not really something that he would have done''. Any pretence of special mining techniques has also disappeared from East Asia's releases - Rochette said in January ''the ore [at Miwah] should be able to be processed in a conventional gold cyanidation circuit''. The gold deal has severely dented Sun's reputation in Aceh. ''They heard it and said, 'Oh, we are cheated','' recalls Hadi Daryanto, the secretary-general of Indonesia's forestry department in Jakarta. One of Governor Irwandi's senior environment advisers, Wibisono, has said the deal destroyed trust. ''People started to think that … the intention was not to protect the environment, [but for Sun] to occupy all that land, and then later on-sell it to the mining company or plantation.'' Since then, he says, the mining company has tried every method possible to have the forest re-categorised, including approaching the government through its powerful ex-combatant constituency. For his part, Irwandi has become morbidly disillusioned with the failed promise of REDD. Three months after Carbon Conservation inked the Miwah deal, he issued a permit for a palm oil company, PT Kallista Alam, to use 1605 hectares of peat swamp for a plantation in the Tripa conservation zone. Sun says he is still on good personal terms with Irwandi, and argues passionately that the deal with the mining company was both pragmatic and necessary. As the public servants of Indonesia's Forestry Ministry stand waiting for the lifts, they are assailed by warnings against graft. "Stop bribes, corruption," says a large sign on level three. "We officers of the Ministry of Forestry are anti-bribes," asserts another. It would seem patronising if it were not so necessary. "The forestry sector," said Chandra Hamzah, the deputy chairman of Indonesia's Corruption Eradication Commission, in 2010, "is a source of unlimited corruption." The department earns $15 billion a year in revenue from selling forestry permits and the investors with the deepest pockets are those who want to log forests or turn them into plantations. The illegal trade in logging and forest concessions, fuelled by bribes, cronyism and corruption, is invisible but probably many times larger. On climate change, Indonesia is being pulled in two directions. Politically it appears serious about the task of reducing its emissions, 60 to 80 per cent of which are due to deforestation. The President, Susilo Bambang Yudhoyono, has pledged to reduce emissions by 26 per cent without international help, and by 41 per cent if such help is forthcoming. But economically, the drivers of deforestation have not changed. There is big foreign cash to be earned as a coal and timber producer and the world's largest exporter of palm oil. Into this messy context five years ago walked an experienced environment project investor, the American Todd Lemons, wanting to establish a Reducing Emissions from Deforestation and Degradation (REDD) scheme to sell carbon credits to the world. By July 2010, Lemons had jumped 11 of the 12 hurdles mandated by the Indonesian bureaucracy, spending $2 million in the process. He believed his 90,000-hectare Rimba Raya project on Kalimantan would be the first to sell carbon credits from Indonesia into the world market. Rimba Raya was intended to produce 100 million tonnes of credits over its 30-year life and he had forward contacts in place with the Russian gas company Gazprom to buy them. All he needed was the forestry minister's approval. But on the verge of success, he was informed the ministry had halved the size of Rimba Raya, making it unviable. The rest of the land was signed over to a palm oil company, PT Best Group. The project went into limbo, and, almost two years later, there it remains. Lemons and his business partners declined to comment. It is understood in business circles in Indonesia that Rimba Raya fell foul of nationalist sentiment by announcing the deal with Gazprom too early. Hadi Daryanto, the quixotic secretary-general of the forestry ministry, told The Sun-Herald that Rimba Raya was just "a big noise". "They were here from Singapore, [asking], 'Why you kill the Rimba Raya?' I don't kill. They are stupid. They don't have the licence when they go to market." Despite the government's support for REDD projects, private schemes in Indonesia have fallen by the wayside. Many of those surviving are run by the public sector, including Australia, but even these are foundering. The flagship program, the Kalimantan Forests and Climate Partnership, set up with money pledged in 2007 by John Howard, has been "quietly but drastically scaled back", according to a report from the Australian National University. The area now being worked on is just over 10 per cent of the original target and the Australian Department of Climate Change concedes that getting the support of local people has been difficult. Norway has also come into Indonesia with $1 billion to try to fix its institutional problems. So far, those problems are so deep, the Nordic country has only been able to disburse $30 million of its money. Money-makers such as Macquarie Bank and Merrill Lynch-Bank of America have not given up. Macquarie's Brer Adams is armed with a $25 million fund, "BioCarbon" and is hunting for REDD projects in Indonesia, and Merrill Lynch's Abyd Karmali said he was still keen to develop "instruments" to allow his clients to invest in REDD. But the most prospective private REDD project is run by an Indonesian company, PT Rimba Makmur Utama. At the helm is Dharsono Hartono, an Indonesian who admits he is "crazy" to attempt it. Born in Indonesia but educated at the US Ivy League university Cornell and a 10-year veteran of international banks in New York, Hartono has the credentials to navigate the tangle of bureaucracy, nationalism and corruption that is Indonesia. But even he has been trying for five years to get through the approvals process. "To be successful in REDD you need time," he said. "At the moment the market [for REDD credits] is uncertain, the regulation is uncertain, the initial cost is high. You'd have to be crazy to do it." Hartono's concession covers 200,000 hectares of forest in central Kalimantan, home to perhaps 4000 of the world's remaining 60,000 orang-utans. Just one hurdle remains - approval from the minister. It's the hurdle that tripped Rimba Raya and Todd Lemons. Hartono hopes to clear it, but he is not counting his chickens. "I have to be realistic. I understand risk. If I'm not successful, I will have to cut my losses. The next 12 to 24 months will be a good test." Whatever new climate change institutions have been set up in Indonesia, the real power still resides with the old, powerful economic ministries such as forestry. Hadi Daryanto, the forestry department's secretary-general, says he is supportive of REDD. In an interview with The Sun-Herald, he likens carbon to electricity - invisible, but a saleable commodity nonetheless. Daryanto also knows exactly how to calculate its economic value. Leaping to his feet and going to a nearby whiteboard, he sketches it out. "If REDD is to happen, then the solution is about the payment for environmental services and the price of the carbon compared with the logs," he says. Australia's carbon tax will pay just one-third of this amount from July 1, and the European market is paying about one-seventh. "Who will pay?" asks Daryanto. "If the price is below the [price of a] log, nobody wants to sell. They just cut the trees … It is a question of economics, not a question of conservation." A HUGE Australian-owned forest-carbon project in Indonesia has stalled and may need to be abandoned entirely because of a recent change of government in the province of Aceh. Australian businessman and former chief of the Australian Prudential Regulation Authority Jeff Carmichael has outed himself to The Saturday Age as a seven-figure investor in the Aceh project run by Dorjee Sun, environment entrepreneur and star of the 2009 documentary The Burning Season. But Dr Carmichael acknowledges that, due to ''political risk'' in Indonesia, he might lose the money he's already spent. The project, called Ulu Masen, is just one of a number of forest carbon projects which have faltered or been abandoned in Indonesia as the early hype over REDD - Reducing Emissions from Deforestation and Forest Degradation - proves vastly exaggerated. Publicly funded REDD schemes in Indonesia have also come under fire recently, with Greens leader Christine Milne proclaiming an AusAID project in Kalimantan that has already cost $30 million ''a failure''. Ulu Masen was designed by Mr Sun and then Aceh governor Irwandi Yusuf in 2007 to preserve 770,000 hectares of prime Aceh forest, including carbon-rich peatland. It was intended to generate millions of carbon credits to be sold on the world market. The money would go back to the Aceh government, the project's proponents and to local people to help preserve the forest from oil-palm plantations, loggers and miners. But so far no carbon credits have been generated or sold and the project has not achieved verification from independent certifying bodies. Dr Carmichael said he had pledged a "seven-figure sum" of his own money to help Ulu Masen gain certification. However, that process had stopped because, since Mr Irwandi was ousted in elections two months ago, the new governor, Zaini Abdullah, has not agreed to a meeting. A spokesman for Mr Zaini told The Saturday Age that the project was "under review". Dr Carmichael conceded he may lose the money he has spent so far. ''Subject to having a governor that confirms to us that he's committed to seeing it through, we're committed to staying with it,'' Dr Carmichael said. 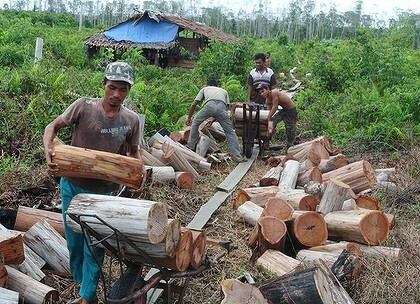 Since 2007, Indonesian forests have been at the centre of Australia's hopes for an international trade in REDD credits. But now, on the verge of the carbon tax being implemented, there are serious doubts about whether REDD can ever work on a large scale in Indonesia. 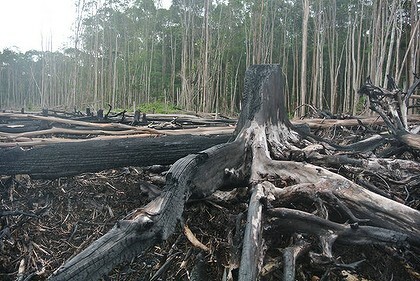 Dr Carmichael said he remained convinced that REDD was a legitimate means of offsetting industrial emissions, but agreed that ''political risk'' could make it difficult in Indonesia, which has one of the highest deforestation rates in the world. ''Indonesia probably wasn't my first choice of country because I have worked there in the past and I know the difficulties,'' Dr Carmichael said. Mr Sun said Australia did have a chance to help Indonesia by using its carbon price - which at a starting price of $23 a tonne is higher than the global price - to encourage Aceh. ''If Australia could step in and say, 'Hey, we're going to buy carbon from REDD, but we're going to focus on bilateral arrangements' … that could single-handedly give us a reason why the new governor of Aceh would step up and say … 'We're going to have Aceh-ready credits for export in a year's time','' Mr Sun said. OPPOSITION Leader Tony Abbott has challenged Victoria's practice of clearfell logging native forests, saying few people would not be revolted by the damage it caused. Speaking at a community forum at Mount Evelyn, east of Melbourne, Mr Abbott said he supported a sustainable native forestry industry, but took issue with clearfelling, in which a forest area is bulldozed, logged and the remains burned. Mr Abbott said he supported sustainable logging of native forests, citing a Cape York program under which select trees were felled individually. ''You can't destroy the asset, but I do think the asset is there to be economically appreciated as well as aesthetically appreciated,'' he said. His comments came as 31 people were arrested for blocking clearfell logging on the side of Mount St Leonard, near Healesville. About 70 local business owners and conservationists walked into a logging coupe early yesterday, some wearing masks with the face of Premier Ted Baillieu. Police said 31 were charged with failing to leave a public safety zone. 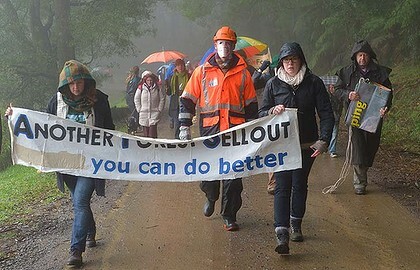 Protester organiser Chris Veenhuizen, owner of a local bed-and-breakfast and member of conservation group MyEnvironment, said visitors were being turned off by the destruction of clearly visible forest. David Walsh, of government forestry agency VicForests, said timber from the Mount St Leonard area was crucial to it meeting demand for wood and wood products. He said VicForests had previously responded to community concern by removing two coupes earmarked for logging and leaving a 50-metre forest buffer along a walking track. ''Timber harvesting has co-existed with tourism in the region for decades, and we believe both industries play an important role in the local economy,'' he said. Victorian government media advisers did not return calls from The Age.